A car accident injures her parents and paralyzes Janine from the waist down. Her best friend and teammate urges Janine to look into sledge hockey. 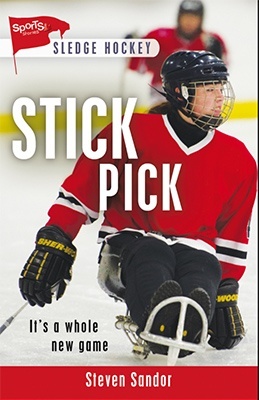 At first dismissing the sport as being just for the disabled, Janine agrees to play if her friend does too. They both learn that sledge hockey is an accessible sport, with fiercely competitive players, requiring a strength and skill set all its own. Adapting to her new life, Janine meets frustration at every turn. Soon her experiences lead her to speak up about the seeming invisibility of disabled people and their rights, taking her cause all the way to the professional hockey arena. Based on Steven Sandor’s real-life experience and research, this story tracks the emotional and physical challenges a young teen faces when first dealing with disability.